"The LifesMiracle Sampling Program is One of the Best Ways to introduce LifesMiracle Products to Everybody!" The main benefits of samples is that they give your customers the chance to try a great product that gives them immediate results! Nitro3 Caps has been shown to increase energy, focus, and endurance without all the negative side effects to all the energy drinks out there. Includes a three-day sample. 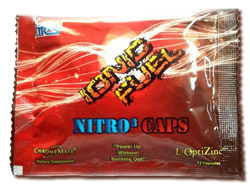 The LifesMiracle Home Office will send out Sample Packs of our Ionic Fuel Nitro3 caps for a flat rate of $4.99 with free shipping! Build your business and teach this simple system to your group to increase your sales worldwide! For LifesMiracle Distributors only: Go into your backoffice and under the "Orders" link place a separate order for each person you want us to send a sample to, and provide us their shipping address on the form provided. Limit one sample per address. If you are not a member of LifesMiracle and you want to try a sample, click on the image of the Nitro Caps above!